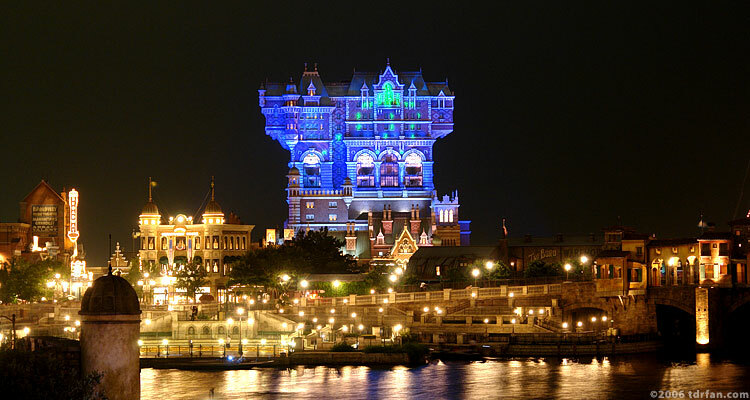 Tower of Terror is quite possibly DisneySea's most exciting attraction. It's classified as a thrill ride, but what makes this attraction so fantastic is a brilliant buildup to the heart-stopping climax. The buildup to this attraction starts before you even get in line. The Tower of Terror is truly towering and impossible to ignore; it's nearly as tall as DisneySea's iconic Mount Prometheus, and can be seen from just about anywhere in the Park. Like the rest of DisneySea, its design and attention to detail is exquisite, and one can spend a great deal of time just standing outside admiring the architecture. It is even more impressive at night, when beautiful theme and special-effects lighting can be fully appreciated. Tower of Terror has a background story, bits and pieces of which can be found by reading the mock newspapers posted around the attraction and which is further explained on the attraction itself (albeit in Japanese). 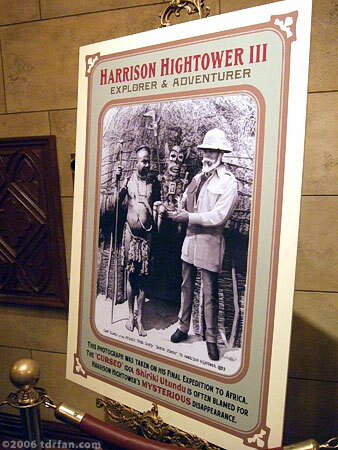 The story goes something like this: Harrison Hightower III was a wealthy and notorious explorer and collector. On New Year's Eve 1899, he was to hold a press conference in his luxurious Hotel Hightower to announce his acquisition of a strange statue named Shiriki Utundu, recovered on an expedition to a remote region of Africa. Something went terribly wrong however: As Mr. Hightower was taking his statue to the hotel's penthouse apartment, the elevator inexplicably came crashing down to the ground! The statue was the only thing found in the elevator; Mr. Hightower mysteriously disappeared without a trace. (It was after this "accident" that people began calling the hotel the "Tower of Terror.") The hotel remained closed for over 100 years, but was recently opened by the New York City Preservation Society to allow people to tour the hotel and view Mr. Hightower's collection of treasures. Your "tour" of the hotel starts in the lobby. Here you can view some of the lavish decor, and also see the now-destroyed elevator that Mr. Hightower was riding in on that fateful night he disappeared. As you reach the end of the lobby, you form into a group and a cast member explains a little about Harrison Hightower III and his statue. You're then taken into Mr. Hightower's private office, where the story about the mysterious statue is further revealed in dramatic fashion. I won't spoil the surprise, but I will say the special effects here are amazing, and further build up anticipation of the ride itself. The queue winds through a warehouse holding additional treasures and artifacts, and you finally reach your destination: the service elevator that will take you up to the penthouse. Unlike any other service elevator I've been in, this one is equipped with about 20 seats, each seat having its own automobile-style three-point seatbelt. After you're belted in, your ride to the top begins. On the way however you encounter the statue Shiriki and experience firsthand its terrifying power. After the statue casts its spell, elevator doors open and you get a bird's-eye view of DisneySea from high up in the tower. The view doesn't last long however, as the elevator suddenly drops in a freefall! Of course you stop short of crashing to the ground, and eventually wind up safe and sound back at the ground floor. Although the "freefall" element may put some people off, the stops and starts of the freefall are very smooth and in and of itself not particularly scary. As mentioned earlier, it's the superb, multi-layered buildup to the freefall that makes it so dramatic. Although the "thrill ride" portion of the attraction lasts only a few moments, the attraction as a whole is truly exhilarating and—unless you just don't like thrill rides—something that should not be missed.